Clicking on superscript numbers in the text brings you to footnotes in the original submission, which appear in this column, below; hitting the back button on your browser returns you to your place in the body of the main text. Other links in the text take you to materials elsewhere in the Victorian Web. Formatted, with added links, illustrations and captions, by Jacqueline Banerjee. Click on images to enlarge them, and for more information about them. The Quarterly issue of December 1842, bound here with that of March 1943, carries the long account of anti-Corn Law disturbances in the North of England referred to in the main text under the heading, "Keeping our friends in the right course." (The image is taken from the Harvard University copy of this issue of the Quarterly which has been contributed to the Internet Archive). 1. ER Jan 1807: 278: Gentz on the "State of Europe." 2. The fifth Canto of Marmion was addressed to Ellis. A parody by Canning and Ellis of contemporary German drama was performed at the Haymarket Theatre, London in 1811. 3. Letter to Murray of 2 Nov 1808 (Smiles: Memoir ofJohn Murray, 1891, I: 102-03). 4. ER Oct 1808: 215-234: Don Pedro Cevallos on the French Usurpation of Spain. 5. In a letter of 15 Nov, Scott told Murray that the article had provoked "disgust beyond measure" and that subscribers "were falling off like withered leaves" (Memoir of John Murray I: 113-5). 6. QR Feb 1809: "Affaires d 'Espagne." Attribution of the wholly anonymous articles during the period follows the work of Hill and Helen Shine: The Quarterly Review under Gifford: Identification of Contributors 1809-1824 (University of North Carolina Press, 1949); and The Wellesley Index to Victorian Periodicals 1824-1900, Vol.1 (1988). Additional information on the earlier period is to be found in the Quarterly Review Archive (www.rc.umd.edu). 7. When the QR of Nov 1809 sought to vindicate Canning's position in "Mr Canning's Letters to Lord Camden," the ER (Jan 1810: "The State of Parties") mocked its preoccupation "at such a moment as the present .. with the squabbles of Lord Castlereagh and Mr Canning." 8. In his earlier radical phase, Southey had been attacked in the Anti-Jacobin for his millenarianism, metrical experiments, and complaints about injustices of the poor. In the "Life and Letters of Southey" (QR: Dec 1850), John Gibson Lockhart and the Rev. Whitwell Elwin suspected that he "never entirely rid himself of his ancient disfavour for Gifford as editor of the Anti-Jacobin." But he was well paid by Murray and benefited from his association with the QR in another way — in 1813, following a suggestion by Croker to the Prince Regent, he was appointed Poet Laureate. 9. QR Jan 1817: "Rise and Progress of Popular Disaffection," 545. 10. QR Dec 1812: "Inquiry into the Poor Laws," 320. 11. QR Dec 1812 — see above; Oct 1814: "On improving the condition of the Poor"; Apr 1816: "The Poor"; Jan 1817: "Rise and Progress of Popular Disaffection"; Apr 1818: "On the Means of Improving the People"; May 1818: "On the Poor Laws." The last two were notably tougher than the earlier, perhaps due to joint authorship with John Rickman who, as a House of Commons Clerk, prepared annual abstracts of the Poor Law returns. 12. QR Dec 1812, 351. 13. QR Apr 1818, 111. 14. QR Oct 1821: "Morellet's Memoirs of the French Revolution"; Jan 1823: "Lacretelle's The Constituent Assembly"; "Madame Campan's memoirs of Marie-Antionette"; and "Memoirs of the Royal Family of France." 15. QR Oct 1821: McQueen's "Africa, Niger River and the State of the Slave Trade"; Oct 1822: "The Slave Trade"; July 1823: "Condition of the Negroes in our Colonies"; Jan 1824: "West India Colonies; Oct 1825: "West Indian Slavery"; Sept 1826: "State of the Slave Trade." 16. QR: Jan 1831: "Moral and Political State of the British Empire," 284. 17. Letter of 26 May 1845 (Clements Library, University of Michigan, Ann Arbor). 18. Croker was in a difficult position. Wellington and Peel had both refused to serve under Canning. In a letter to Canning of 3 April 1827 he referred to "my regard and gratitude to the Duke of Wellington — my private love for Peel — and my respect and admiration for you" which all made him "most anxious that you should all hold together" (Croker Papers, ed. Louis J. Jennings, 3 vols, 1884; I: 369). 19. 1n 1822 Canning referred to the "mighty power of Public Opinion, embodied in a Free Press, which pervades and checks and perhaps in the last resort nearly governs the whole [constitutional process]." 20. The QR (May 1809: Parliamentary Reform) described an article in the ER's 20th issue as "a work from many parts of which no feelings of competition could justify us in withholding our unqualified applause." 22. Letter of 2 Feb 1835 (Add MSS 40321 ff.90-1). 23. Croker Papers II: 256-57. 24. See his powerful letter to Croker of 2 Feb 1835 (Croker Papers II: 264-65). 25. QR Jan 1834: "Liturgical Reform"; QR May 1843: "Rubrics and Rituals of the Church of England"; QR June 1851: "Rubrics versus Usage." 26. Letter of 20 Feb 1842 (Add MSS 40502 ff.326-7). 27. QR: Sept 1842: "Policy of Sir Robert Peel," 503. 28. Croker Papers, III: 386-87. 29. Letter of 22 April 1845 (Add MSS 40565 ff.9-10, given in Croker Papers III: 32). Peel regarded the opposition to the Maynooth grant as mainly that of "Dissent in England — partly fanatical, partly religious.... All this raises a storm at which I look with much indifference." 30. QR: Sept 1843: "Policy of Ministers," footnote, 554 — rebuked the members of Young England for the "extreme inconsistency and impolicy of endeavouring to create distrust of the only statesman in whom the great Conservative party has any confidence or can have any hope," adding that this would "certainly confer on them no permanent consideration with any party or constituency." 31. QR: Dec 1850: "The Ministers and the Pope": June 1852 postscript to Lord Holland's "Memoirs of the Whig Party"; Sept 1852: "Parliamentary Prospects." 32. See David Morphet: "Political Comment in the Quarterly Review after Croker: Gladstone, Salisbury, Jennings" (Victorian Periodicals Review, 36/2 (Summer 2003). This paper describes the course of political comment in the Quarterly Review over the first half-century of its existence. It shows how, although its views were generally predictable, the flagship of Tory orthodoxy did not always follow a steady line, particularly when Tory governments themselves changed course. The paper focuses on major political themes of the period — the unrest following the Napoleonic Wars; the continuing shadow of the French Revolution; the condition of the poor, the exploitation of child labour; the abolition of the slave trade; the 1832 Reform Bill; Ireland and Catholic emancipation; Church reform; and the repeal of the Corn Laws in 1846, and consequent split in the Tory party. It shows how the Quarterly was coloured by association with three great figures of the age — Canning, Wellington and Peel. 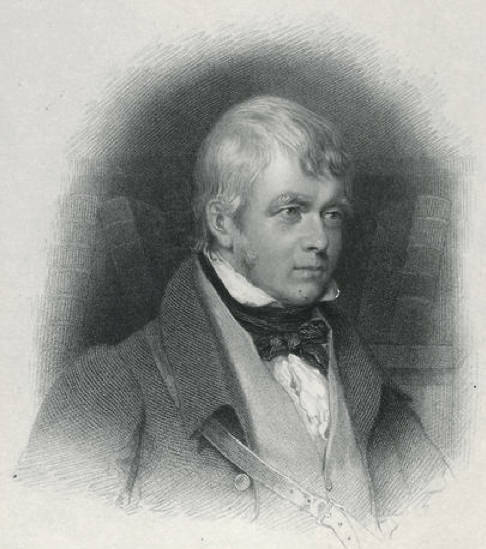 Sir Walter Scott, engraved by Gilbert Stuart Newton (1794-1835) from a painting by William Finden (1794-1835). He joined the Quarterly with alacrity. The whole of Britain is giving its backing to Spanish patriots who have undertaken a revolution against their worthless king and nobility. This Spanish revolution places the cause of freedom and reform on a much better footing than did the French Revolution of 1789, because both the British government and the British people are committed to it in a way we never were in 1789. So let us offer a deal to Napoleon. We will drop our opposition to him if, in exchange, he agrees to leave the Spanish patriots alone. Should we succeed in this, the article concluded, we shall "purify the ... constitution of this and other countries of Europe ... raising up the power of real talents and worth, the true nobility of a country — by exalting the mass of the community" — a near-republican pronouncement which enraged Tory loyalists.5 Four months later, the first issue of the Quarterly, leading with an article on the Spanish situation in which Canning had a hand,6 accused the Edinburgh of "a style ...too arrogant ... for professors of our gentle craft." Murray had obtained what he wanted — a combative, loyalist review under the wing of the Foreign Secretary. But Canning was manoeuvring for his colleague Castlereagh to be ousted as Secretary for War. By the autumn, the two men had fought a duel, and both were out of office.7 Murray had approached Canning just in time. Had he missed this opportunity, another loyalist periodical of high quality might eventually have emerged in contention with the Edinburgh, but not the Quarterly Review as we know it. Murray would have thought twice about approaching Canning after the duel, and Canning's successor as Foreign Secretary, Marquis Wellesley, was a far less approachable character. However, the Review was well under way, and in the hands of a group determined to make a success of it. Gifford, the Editor, was to be at the helm for several years. Canning himself continued to take a strong interest. Scott contributed literary articles up to 1818 and beyond. And by then the great early Quarterly contributors — John Wilson Croker, Robert Southey, 8 Sir John Barrow — were in harness. As a pro-government publication, the Quarterly made rapid progress. In 1817, when Murray was printing 10,000 copies, Southey told a friend that "fifty times that number" read its contents. Even allowing for exaggeration, this shows the mark which the Quarterly had made. 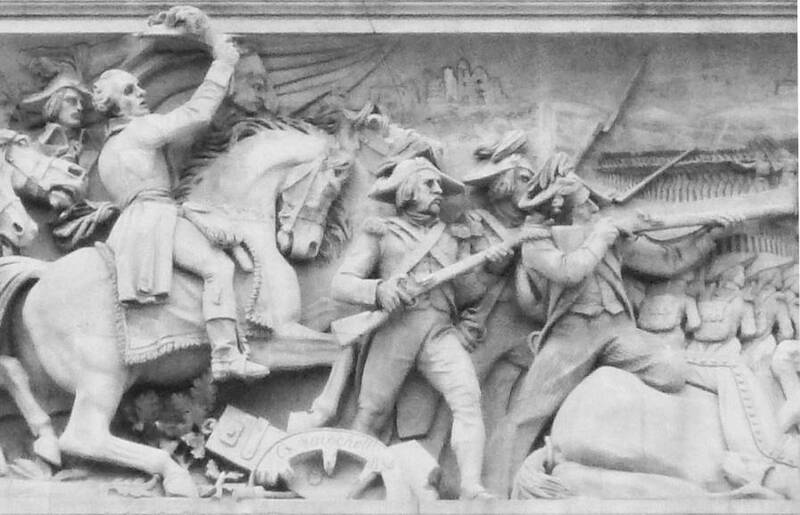 Relief on the Arc de Triomphe by Carlo Marochetti, showing Louis Philippe and other important French figures rallying the French troops during the Battle of Jemmapes in the French Revolutionary wars. The work was completed during the July Monarchy. There was a great fear of any such revolutionary uprisings at home. "For years after the War, Parliamentary opposition was weak — "never at any time so little formidable either for talents or for their credit with the people. "9 The Review's main political focus in this period was on the state of the nation — the poverty and discontent fuelled by post-War depression; and what it called the "morbid change in the great body of the populace" brought about by the industrial revolution.10 Several articles of the period — mostly by Southey — addressed the growth of pauperism, the widespread abuse of the Poor Law system, the need for basic education for the poor, the need for Savings Banks, and the advantages of assisted emigration, not least for "thousands of men from fifteen to thirty, the flower of the country, now languishing in poverty and inaction. "11 The remedies offered were paternalistic. One article went so far as to propose the construction of "pyramids in honour of our Nelsons and Wellingtons" — rather than have men dependent on charity — "half Luddite, half Lazzaroni. "12 A firm line was drawn throughout between the deserving poor and able-bodied spongers. The latter were to be given a "low diet" and hard work;13 and there were strong words for those seeking to create or exploit unrest, not least the unstamped press. Following threats to public order in 1819 (notably the "Peterloo" demonstration and the Cato Street conspiracy) articles of January 1820 ("State of Public Affairs") and October 1822 ("The Opposition") identified demagoguery and the press as the root cause of trouble, to which the latter article added the Whig opposition. While disaffection was blamed chiefly on the influence of "LIBELLOUS PUBLICATIONS," the Whigs were accused of weakening the country's defences by giving aid and comfort to the "gigantic sect [of anarchists]," for which the press provided a "mighty engine [revelling in] uncircumscribed licentiousness." The "constant labour" of the opposition, it was claimed, was "to excite discontent." Their newspapers opened the path for those of revolutionists, since the "uninstructed lower classes" were unable to distinguish between the (Whig) Morning Chronicle and the (Radical) Black Dwarf In an age of mechanical improvements, no other craft had been "carried to greater perfection than that of newspaper-making"; and the "liberal prints" of England and the continent had been "conducted into one mighty channel." The press was full of articles framed "to conceal the truth and bring contempt and hatred on established governments and religions." The Whigs should take care to "make no more false and inflammatory speeches." These were anxious times for the governing classes and it is not by coincidence that the 1820s saw the first of Croker's many articles on the French Revolution.14 Croker believed that by constantly showing the pernicious effects of revolution in France, he could contribute to the avoidance in Britain of revolution or reform à la francaise. 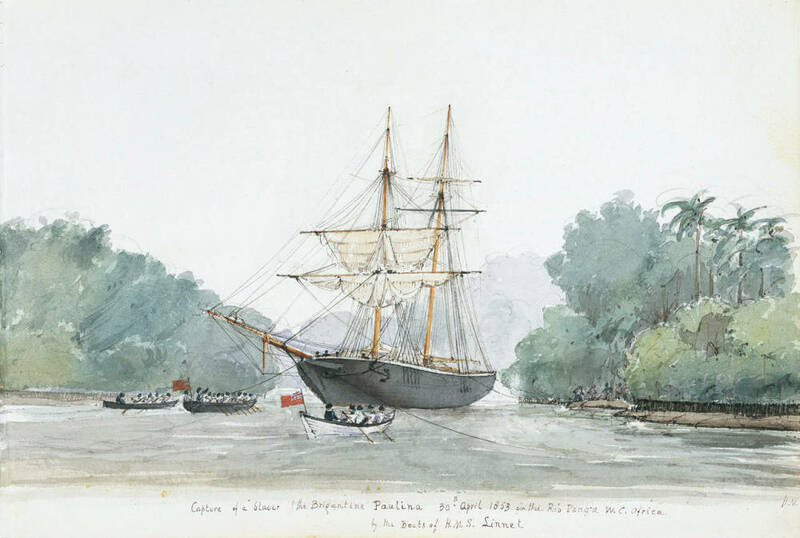 Capture of a slaver, the Brigantine "Paulina" 30th April 1853, by Captain Henry Need of HMS Linnet. © National Maritime Museum, Greenwich, London, by kind permission. In the 1820s, the Review addressed a topic of great public interest — British efforts to suppress the slave trade. A series of articles 15 condemned the continued activity of French, Spanish and Portuguese slave traders, and saluted the efforts of the Royal Navy to frustrate them. As for emancipation, the articles saw "the mitigation and abolition" of slavery in the British West Indies as "a goal which should be pursued with zeal and perseverance," but envisaged a gradual process, with compensation to the slave-owners. Here, the Quarterly took its cue from Canning who, following Castlereagh's suicide in 1822, once again became Foreign Secretary. Following the act of 1833 abolishing slavery in British colonies, the Review published graphic evidence of the continuance of the slave trade (December 1835: "The Foreign Slave Trade"), and urged the reduction of tariffs on sugar from the West Indies, now facing severe competition from slave-state producers. The point was pressed again in an article of December 1850 ("Cheap Sugar and the Slave Trade"), which castigated Peel for refusing to support protection of West Indies sugar, and lamented a resurgence in slavery, particularly in Brazil, following increased demand for sugar in British and other markets. A contemporary picture of No Popery protests. One topical issue curiously neglected by the Quarterly up to the mid-1820s was that of Catholic Emancipation — the removal of the bar on Roman Catholics holding public office. According to Southey,16 this was due to Canning's influence with Gifford, and there are good reasons for believing this. Canning favoured emancipation; knew that Quarterly readers were strongly opposed to it; and did not want the matter — which had been deliberately left an open question within Cabinet — to be unnecessarily stirred up. 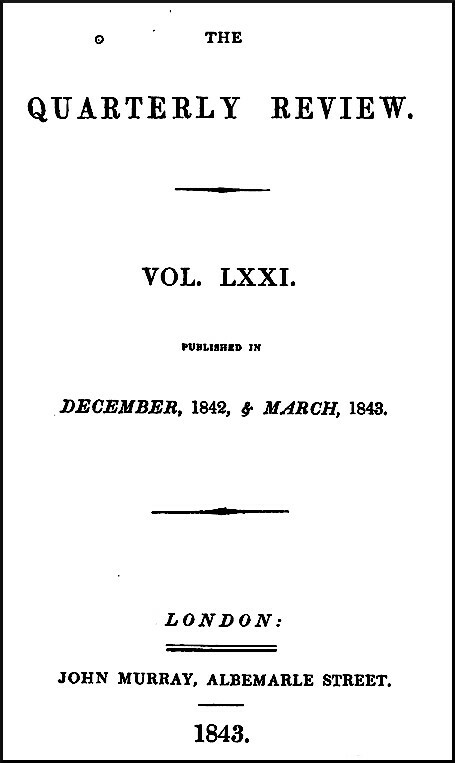 Ill-health brought Gifford's editorship to an end in 1823. After a brief interregnum, he was succeeded by Sir Walter Scott's son-in-law, John Gibson Lockhart, who lacked Gifford's high-level political contacts. The change of editorship was mishandled by Murray, and Croker, the Review's best political source, was alienated, with unhappy results. In July and October 1828, Lockhart allowed two articles to appear which were markedly hostile to the Catholic position. The latter ("The Roman Catholic Question — Ireland") mounted a graphic attack on the Roman Catholic hierarchy in Ireland, asserting that they were not to be trusted; that their claims masked a bid for ascendancy; that compromise with them would be nugatory given their sworn loyalty to the Pope; and that history showed that tolerance was not part of Roman Catholic practice. "Emancipation", for them, meant "supremacy." The Catholic Association was deeply subversive, highly organised, and priest-ridden. The key was to better the condition of the people and: "Catholic Emancipation will then become as vain and feeble a cry in Ireland as Parliamentary Reform has become in England." Croker occupies a pivotal position in Quarterly political writing. An Irish protestant, he became Secretary to the Admiralty in 1809 and remained in that post through successive Tory administrations up to 1830. He was close to the centre of government throughout that period. He was a protégé of Wellington; and a personal friend of Peel. These contacts are well illustrated by a dinner which he gave in 1826 for Sir Walter Scott to meet Peel, Wellington and the then Prime Minister, Lord Liverpool. Although he was not as close to Canning, the latter sought, and valued, his advice when he became Prime Minister in 1827. Croker was invited, but declined, to serve in Canning's Cabinet.18 His knowledge was sorely missed by the Quarterly for the five years up to 1831 during which he contributed no political articles. But this was to change. Canning was Prime Minister for barely four months before his untimely death. Though he was no friend of parliamentary reform, he was considerably more sensitive than most politicians of his day to public opinion.19 He was ready to transfer a modest number of seats from rotten boroughs to large towns lacking representation, and might have found ways to broker change within the broad Tory-Whig compact which his administration comprised. He would certainly have looked to the Quarterly to support a pragmatic approach. But things turned out differently. Wellington, his successor, resisted all proposals for reform, and when he in turn was replaced by a Whig Government in 1830, his protégé Croker fought the ensuing Reform Bill at every stage, making a name for himself in the process. In November 1831, reviewing Croker's edition of Boswell's Life of Johnson, Lockhart noted that "In the history of Mr Croker's reputation the year 1831 will ever form a remarkable epoch ... Within a few months, the 'clever, sharp man of subordinate official details' has raised himself in the House of Commons to the rank of a first-rate Parliamentary debater." The Quarterly exchanged fire with the Edinburgh throughout the Parliamentary debates of 1831. An article of February ("Parliamentary Reform") took the opportunity to tease the Edinburgh — referred to as "a certain Northern journal" — about its earlier caution on reform.20 The Edinburgh followed up in March ("Reform and the Ministry") and June ("The Dissolution and the Election, with suggestions to the Peers"). Further Quarterly pieces came in April ("Reform in Parliament") and July ("Friendly Advice to the Lords"). The former noted "hard names and contemptuous abuse [of which] we come in for rather a flattering share." The latter claimed that the Review had secured. the general concurrence [of] that class of persons to which literary discussion addresses itself ... Not only are the men of property, men of business, and all those who are concerned with the working of the social system, opposed to the pretended Reform, but nearly all the Literature of the country (with the exception of the daily press — if that may be called a branch of literature) has ranged itself on the same side. the suicidal parliament — the felo-de-se House of Commons — is no more ... and we are entering on that calamitous career which our ancestors ran between 1640 and 1660, and which the French have been running from 1789 up to the present time ... The new parliament will be the slave of the ministers' masters — the mob and the press and the political unions. After the passage of the Bill, Croker resigned from Parliament, and was promptly engaged by John Murray to write regularly for the Quarterly. This was done over the head of Lockhart, and gave him a position of considerable independence. No longer an MP, he had time to write at length about the French Revolutions of 1789 and 1830. Again and again, his articles warned of contagion from the French revolutionary tradition, and the pernicious progress of the English Radicals. 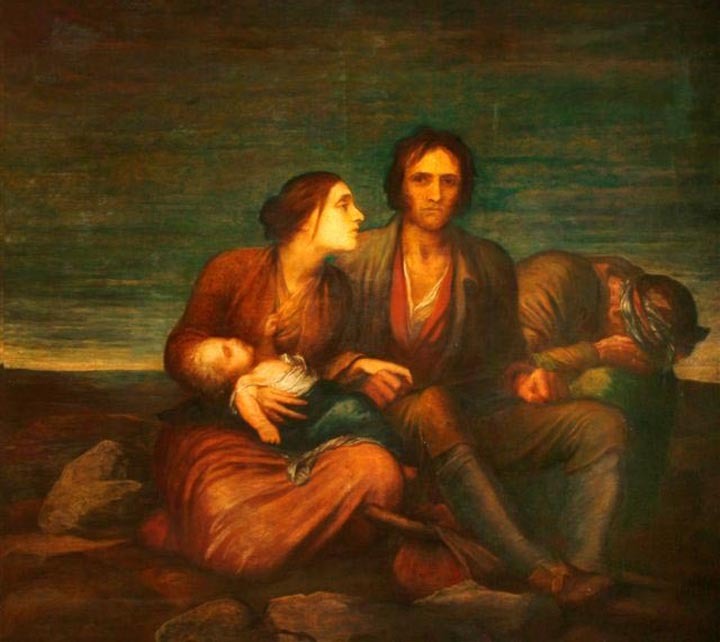 The Irish Famine, by George Frederic Watts, RA (1817-1904), 1850, by courtesy of the Watts Gallery, Compton. Although the Quarterly in no way considered itself an agent of social reform, it was not blind to misery: Southey's articles of the post-Napoleonic period had laid important foundations. "The Poor Law Question" of January 1834 noted glaring abuses and criticised the Poor Law Commission for delay in correcting them. An article by Southey and Croker in the following issue (March 1834: "On the Corn Laws") claimed that the West Indian sugar plantations were like the Garden of Eden compared with cotton mills. In December 1835 ("Foreign Poor Laws — Irish Poverty") George Poulett Scrope contrasted progressive contemporary European practice with the absence of any statutory protection in Ireland against the extremes of poverty. With graphic illustrations, he wrote that "The wretchedness of the mass of the people of Ireland has no parallel on the face of the globe in any nation, savage or civilised.... Shame on that state which shall be the last to recognise ... the right of every peaceable and obedient member of society to the means of existence." This was very strong language for the Quarterly which, in conclusion, made the less philanthropic point that it had been urging government for years to get ahead with an Irish poor law before O'Connell claimed credit for the idea, which he was now doing. Girl pulling a coal-tub in a mine, from a report by the Parliamentary Commission. In what was perhaps the most powerful article of social criticism ever to appear in the Quarterly, Anthony Ashley Cooper, the future Lord Shaftesbury, wrote in "The Factory System" (December 1836) about the "daily torture of children" in factories, imploring legislators to "have mercy" on them. Four years later, an article on "Infant Labour" (December 1840), referring back to the previous article, affirmed "the success of mercy by statute" which had been achieved for children working in wool and cotton mills, and urged the need to extend protection to children working in other trades. It appealed to Parliament to "protect those for whom neither wealth, nor station, nor age have raised a bulwark against tyranny.... All hopes are groundless, all legislation weak, all conservatism nonsense, without this alpha and omega of policy." When Lockhart later proposed an article on a report on the living conditions of the poor, Croker threatened to resign if the Review gave currency to what he regarded as impossibly utopian ideas. An article did nevertheless appear (March 1843: "Report on the Sanitary Condition of the Labouring Classes") which, without calling for specific measures, let appalling facts speak for themselves. Writing on "The Ragged Schools" (December 1846), Ashley Cooper spared nothing in his description of the deprivation of children of the underclass, and the self-sacrifice of those seeking to help them, contrasting this with "ladies and gentlemen who walk in purple and fine linen ... [and] can form no adequate idea of [their] pain and toil." "Will no one," he asked, "roll away the reproach?" We have noted that Croker was a close friend of Peel, to whom the leadership of the Tory party passed in the early 1830s. The political direction of the Quarterly was set by this relationship for well over a decade. Knowledge that the Quarterly, through Croker, was in Peel's confidence, gave its political articles special status even during the years of Whig government during the 1830s, and much more so during Peel's second administration from 1841-46. This was not always comfortable for the Quarterly. Peel was a proud and private man, who exasperated supporters with his lack of party spirit. Defence of his policies sometimes led the Quarterly into taking positions which were unwelcome to its readers. Ultimately, over repeal of the Corn Laws, the Tory party split apart. The Quarterly then had to choose between Peel and the bulk of its readers, and chose the latter. Croker's friendship with Peel came to a bitter end. But to start with, all was sweetness and light. 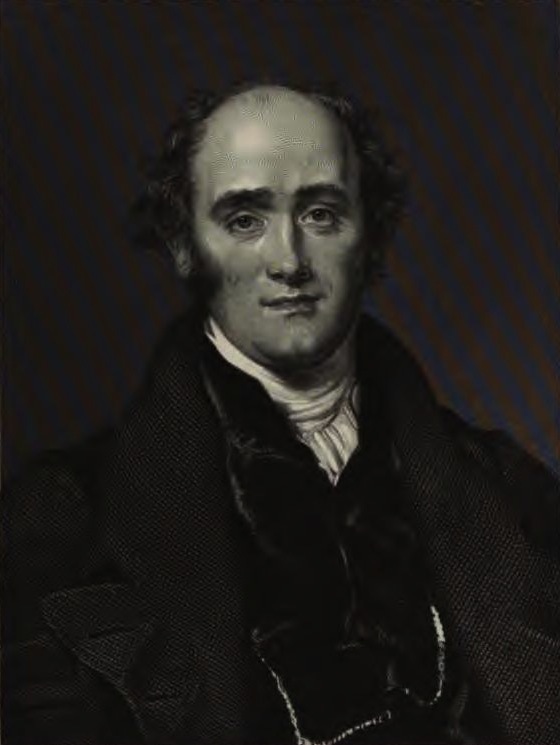 In declining the offer of a cabinet position in Peel's first ministry of 1834-35, he promised that he would speak up for Peel in the Quarterly and that his support was unconditional.22 An early example of this commitment was his article of February 1835 on the Tamworth manifesto ("Sir Robert Peel's Address") which presented him as the last barrier against revolution. Peel thought that Croker had overdone it. The manifesto had been an election address rather than a rallying cry against Reform, and he gently warned Croker not to alienate Whig moderates. He wanted "the adhesion of moderate men, not professing adherence to our politics. "23 It undoubtedly served Peel's purpose to use the columns of the Quarterly, and he took a close interest in what Croker wrote. He had a hand in Croker's article of July 1837 on "The New Reign — present and future parliaments," and provided material for an article of June 1839 ("The Household and the Ministry") on the young Queen Victoria's refusal to part with any of her Whig Ladies of the Bedchamber, an issue which in effect kept Peel out of power for two years. 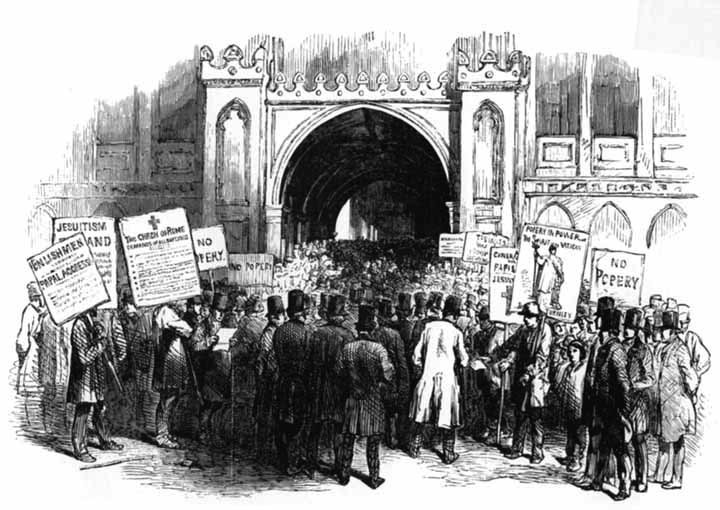 The 1830s saw growing pressure for Church of England reform and removal of its privileges. Repeal of the Test and Corporations Acts in 1828 had ended the formal Anglican monopoly of public offices. Catholic Emancipation had admitted Roman Catholics to the legislature. But there were still major issues concerning Church governance and revenues. Peel saw the need for action24 and, as one of the most important acts of his short first ministry, established in 1835 an Ecclesiastical Commission designed to reconcile the Church to the need for reform. The Quarterly, conscious of its wide clerical readership, took a very cautious line. In a telling article (February 1837: "The Cathedral Establishments"), an Oxford don, William Sewell, warned against the "loud clamour ... for what is vaguely called Ecclesiastical Reform," insisting that the Church should be left to order itself, and that — although the current Commission contained men of good faith — "a machine has been created which ... may in a very few years lay the Church prostrate at the feet of any Irish demagogue or Socinian manufacturer who may, for the curse of his country, be thrust into power in the legislature." Later (December 1839: Gladstone on Church and State") Sewell, in the over¬heated atmosphere of Tractarian Oxford, would refer to the Church as "struggling for existence in the middle of an estranged population" and to "Chartist rebellion ... planned in Socialist chapels licensed by a British sovereign for the worship of atheism." The Quarterly could always be depended on to defend the clerical status quo, whether on endowments, stipends, liturgy or rubrics. Croker himself wrote more than once on the latter,25 resisting proposals for change. In 1834, he referred to the Church as "a beleaguered city", threatened by the strength which the Reform Bill had given to "sectaries of all classes." 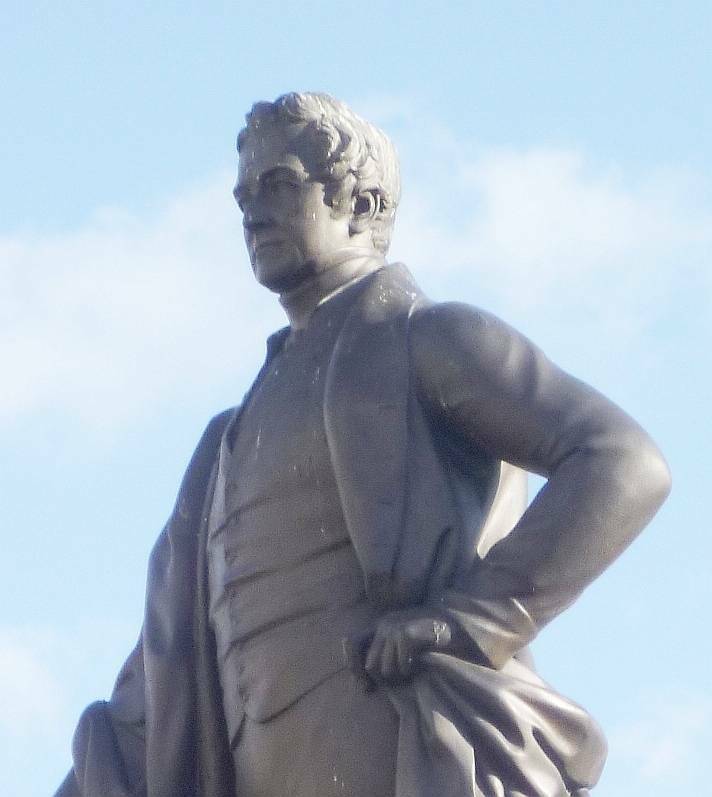 Detail of William Calder Marshall's statue of Peel in Manchester, erected in 1853. As the fortunes of the Whig Lord Melbourne's government ebbed, the Quarterly adopted an increasingly abrasive tone, warning in December 1839 ("Conduct of Ministers — Seditious Meetings") of the advances of Chartism and Socialism, and claiming that government was in the hands of the Radicals. Articles of December 1840 ("Romanism in Ireland") and March 1841 ("Romish Priests in Ireland") claimed that "the peace and harmony of the empire" were being "destroyed by the foreign allegiance of the Irish priests" and their involvement in terrorist activity. The picture painted was one of a situation out of control. For the election of 1841, Croker penned a fierce review of the Whig record in the June number ("The Budget and the Dissolution"). This took issue with views expressed in the Edinburgh, asserting that a fixed duty on corn would "in good years RUIN THE FARMER and in bad years STARVE THE ARTISAN ... CHEAP BREAD is but another name for LOW WAGES." The article ended with an italicised list of eleven categories of those with reasons to mistrust the Whigs, from the "moneyed interest" to the "friends of morality." Croker later claimed that the article had been used as "a kind of conservative manifesto" and "frequently referred to by candidates on the hustings." Following Peel's victory, Croker wrote in the issue of September 1841 ("The Old and the New Ministries") that he had obtained a triumph "only to be paralleled by the glorious sunrise of Mr Pitt." He was "a man of the NEW ERA ... embued with the wisdom of the old." More ominously, the article warned that "there must be no defection or apostasy among conservatives." Croker knew that Peel had enemies in the party, and was widely mistrusted. "Keeping our friends in the right course"
It was at about this time that he wrote to Peel explaining the mission of the Quarterly as "a kind of direction post to a large body of people ... its chief use is to keep our friends in a right course and to furnish them with arguments in support of their opinions. "26 Soon, the Quarterly had become so identified with government policies that it felt it necessary to assert that, while it might be in the confidence of the Conservative party, "we have never affected to be the organ of that party, and our opinions are our own. "27 This would have convinced few. The issue of December 1842 carried a detailed account of anti-Corn Law disturbances in the North, which came, and could only have come, from Home Office sources. 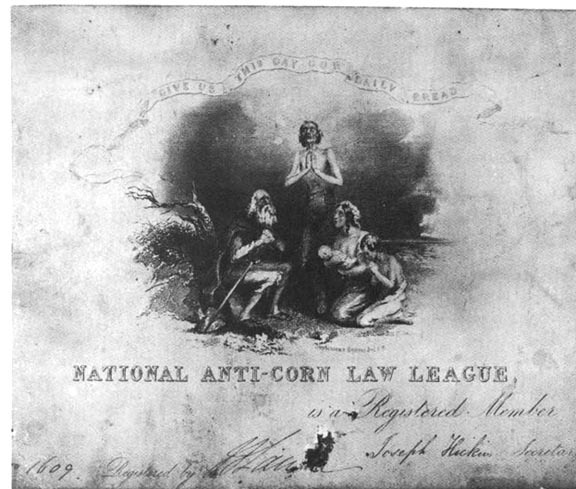 A membership card in the Anti-Corn-Law League. Earlier that year the Quarterly was at pains to defend Peel's first Budget, which had modified — but preserved — the historic sliding scale of duties on imports of wheat, and reduced tariffs on a range of goods in such a way as to suggest that Peel was moving away from agricultural protection towards free trade. This unsettled many Tories. However, Peel had seen Croker's article in proof, and his Home Secretary had praised it.28 This convinced Croker that the 1842 modifications amounted to a permanent commitment to protection via Corn Laws with a sliding scale, and he set out to reassure the country gentlemen that Peel had their interests at heart. An article of September 1843 ("Policy of Ministers") asserted baldly that the government's "political existence is interwoven with the principle of agricultural protection." This turned out to be true, but not in the way the Quarterly thought. In 1845, Peel sought conciliation in Ireland through increasing the grant to the Maynooth seminary and permitting lay endowments of the Catholic church. By supporting the government, as it did, the Quarterly risked offending many of its readers. Half the Tories in the Commons voted against the grant. Following Peel had become increasingly uncomfortable, and Croker wrote to warn him that it was his ambivalence on the Corn Law issue which had caused the difficulties on Maynooth. Peel brushed this aside.29 But with the failure of the Irish potato crop, and a poor English harvest in the autumn of 1845, he decided that the time for Corn Law repeal had indeed come. Finding that he could not carry his cabinet with him, he resigned. By then, his intention to repeal had been leaked to the Times. The Whigs failed to form an alternative administration and within days Peel was back in power. In the Quarterly of December 1845 ("Ministerial Resignations") Croker affected to disbelieve theTimes report, writing that Peel "would not give the slightest countenance to ... unconditional repeal of his own Act ... of three years ago." His correspondence of the period with Wellington and others shows, however, that he suspected Peel had long been contemplating repeal, and had used the famine as a pretext for doing so. We speak of [Peel's] share in the whole of this unhappy affair with the greatest pain ... We have given his administration a cordial, disinterested, and to the best of our power, efficient support; we adopted from his own lips his profession of faith, both commercial and political.... He has changed his opinions — we have not; ... and we must oppose him. He has almost annihilated the only party in the country on which any solid government can be founded and maintained — the Landed Interest. It was the end of an era both for the Tory party and the Quarterly. There was no prospect whatever of Croker building a confidential relationship with the man who before long emerged as Tory leader — Disraeli — whom he had criticised in the Quarterly30 and who had sought to blacken his own reputation in Coningsby; and an approach to future Conservative Prime Minister Lord Stanley came to nothing when his son advised him that "quarterlies are well nigh superseded by the growing influences of the daily and weekly press...." For some time, the Quarterly had little to offer except defence of past positions. Thus, in Lord Holland's "Memoirs of the Whig Party" (June 1852) Croker condemned Holland's "posthumous slander of the persons and principles with which we have been so long and zealously associated" and in the Postscript to that article gave vent to a bitter enumeration of the "anti-constitutional conglomeration" of "old Whigs, young Whigs and ultra-Whigs — Radicals, Balloteers and Chartists — Tenant-Leaguers and Catholic Associators — Jews and Papists — anti-Churchmen, ultra and no-Churchmen — apostate Tories — Puseyites, Peelites, Cobdenites, Humites, and all the other ites and mites of dissent and disaffection." In the same issue, Lockhart and the Rev. Whitwell Elwin were a degree more generous to the founding editor of the Edinburgh in their review of Lord Cockburn's Life of Francis Jeffrey, concluding that the Review "is a monument of which — in spite of all the streaks in the marble — he might well have been proud." The kind of Members sent by the towns to the reformed Parliament ... is a proof that the suffrage has already gone too far.... The multitude, stirred up by demagogues at an election, vote for him who makes the largest promises.... Reform is a road that leads to a precipice. A new era began in 1860 when Lord Robert Cecil, the future Lord Salisbury, was recruited, and wrote the first of over thirty pungent political articles. But that takes us beyond the period under review. This account has shown in broad terms how the Quarterly of the first half of the nineteenth century sought to accommodate itself to changing political circumstance, from the initial period of Tory loyalism in the Napoleonic and post-Napoleonic period, to the uncertain handling by Lockhart in his first years as editor, through Croker's crusading resistance to the 1832 Reform Bill, to his fateful relationship with Peel, and the drift which followed. It has shown that its treatment of some issues was not always consistent. Its basic position on Ireland, for instance, was highly defensive of the Protestant ascendancy and hostile to the Roman Catholic Church. But this was played down under Gifford, played up by Lockhart, moderated over the Maynooth grant, and re-asserted over "Papal aggression." Moreover, although its political position was anti-reformist, it was capable of identifying misery and moral wrong, as in the case of child labour in England, destitution in Ireland, and the continuance of the slave trade. Certainly, its voice was predominantly conservative, conventional and paternalistic. But there were variations in its political strategies and, in the case of Corn Law repeal, holding a steady course through changing politics was more than it could manage.